For over 20 years, Wendy Whiteley has worked to create a huge public garden at the foot of her harbourside home in Sydney’s Lavender Bay. The story behind the garden, and the events in Wendy’s life that led to its creation, is beautifully portrayed by the highly-respected, award-winning journalist Janet Hawley in the book Wendy Whiteley and the secret garden. 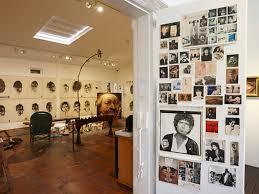 Join us for an exclusive guided tour of the Brett Whiteley Studio in Surry Hills. One of Sydney’s best kept secrets is the studio home of the late Brett Whiteley where he lived and worked from 1988 to 1992. Explore the artist’s private world in the art works, sketchbooks, writings and memorabilia on display. The National Trust S.H. Ervin Gallery has partnered with Australian Cruise Group, to offer a significantly discounted Vivid Sydney Clearview Blue Room Glass Boat Tour! Departing from King Street Wharf, the cruise (valued at $165) includes an 8-course seated and served degustation menu, a selection of premium beer, wine & soft drinks for the duration of the cruise, and restaurant-style dining at individual reserved tables. The boat offers roving views of Sydney Harbour and its star attractions, with a crowd free view of Vivid from both inside, and via the boat’s Sky Deck. Bookings & Information: S.H. Ervin Gallery T:9258 0140 Email shervingallery@nationaltrust.com.au. The S.H. Ervin Gallery accepts no responsibility for accident, injury or loss suffered whilst attending any event, unless it is directly due to negligence on our part. Participants are responsible for taking care of their own property. The S.H. Ervin Gallery accepts no responsibility for any loss incurred whilst using material or information gained at this event. The S.H. Ervin Gallery may at times have to cancel an event. In this case, we will return any payments received in advance. We will not refund any other costs you may incur as a result of this cancellation. Bookings are not confirmed until payment has been processed. Cancellations made within 9 days will not be refunded under any circumstances. All cancellations need to be in writing.